The Random Crayon » Oh look, a crayon in my shoe. » Hooray for Hurraw! I started using Hurraw! when I discovered their amazing black cherry tinted lip balm at Wegmans. Since then I had moved through the coconut lip balm and was pondering what other colors were available when a swift Google opened me to the wonders of their website . 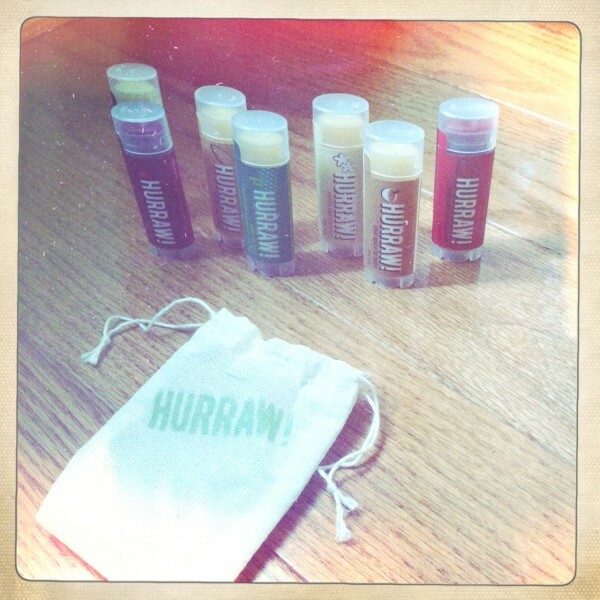 Made with all natural, vegan, and raw ingredients, these lip balms are in a word…amazing. My go to favorite is the black cherry which gives a very natural tint but still gives me enough of a pop of color that I don’t look like an extra on the Walking Dead (assuming of course a Zombie with lips still attached). I also ordered Vanilla Bean, Almond, Cinnamon, Chai Spice, Night Treatment, and they gave me an awesome bonus of their Pitta which is a Coconut Mint Lemongrass. First off, on my shipping notes they said that the Vanilla Bean was made the day it shipped which of course meant I had to try that first. Hands down the best vanilla scent I have encountered, smooth and buttery but not so over powering that I smelled like a cookie. Cinnamon is also a tinted balm and it smelled like my favorite tea and gave a slight tingle. I felt like it gave me a slight plumping effect but it didn’t hurt like most of those evil feeling plumping potions. I did find myself craving a Red Hot though…Nom. Chai Spice smells like just that, rice and creamy and not at all with a chemical after taste. The almond had the most subtle of all scents but it feels great on and I wouldn’t hesitate to share it with my niblets who at 2 and 3 are lip balm obsessed. Night Treatment is a soothing evening scent of blue chamomile and vanilla, very lovely. Pitta was my surprise favorite, the scents blend together really wonderfully and it smells phenomenal. I have yet to find a Hurraw! balm that I haven’t loved though I haven’t made it through nearly all their flavors yet. They’re all wonderfully fresh and made from the best ingredients so you really can’t go wrong, check out Hurraw!